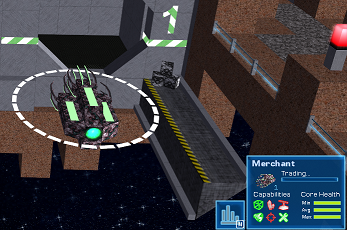 Inside a certain range, the ship will automatically pick up collectable items. 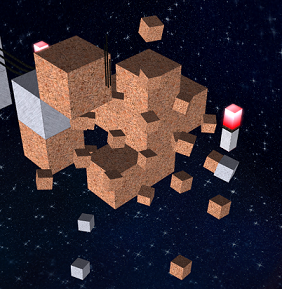 If the ship does not collect your block, you need to move it closer to the item. As soon as the ship collected the block, it is fully available as a block, which you can move/trade/build. Crystal can be found on the upside of asteroids. There are four colours of crystal: blue, green, violet, and orange. 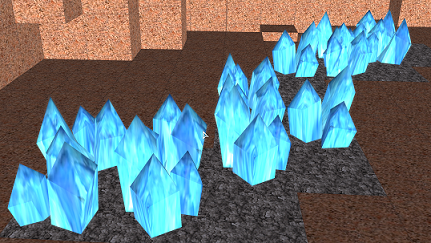 Crystal can be used to process it in the foundry. Each colour results in a different Ship Core type in the processing. Ship Cores are required to build ships. Crystal can be harvested. You need a ship with the harvesting capability ( ) and at least one loading slot. 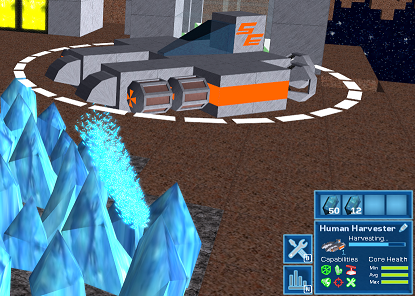 Move that ship over the crystal field, it will automatically start harvesting, as soon as it is in range. These can be found inside of asteroids on the map. Ships with the detector capability ( ) can show you these resources, so you don't need to dig every asteroid you find. 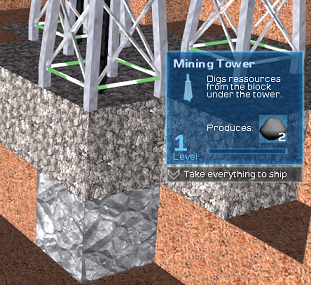 When you find a block of that type, you can build a Mining Tower on the block over the resource to dig material from it. Solar Panels behave exactly like Mining Towers, but they collect energy instead of resources from the ground. They must be placed in range of a nearby sun. 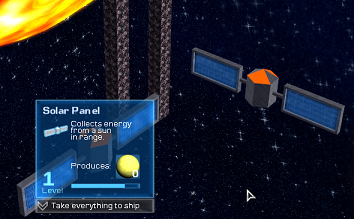 If so, energy items are produced, which can be processed to Powerblocks in the Foundry. As soon as the production has finished, you can pick the produced items from the output slot of the recipe and take the new item to your ship the same way. 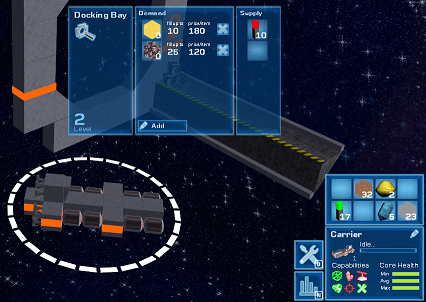 In Docking Bays, players can define their supply and demand of items and blocks. If you find a Docking Bay of a neutral player (Human, Morgrax, or Caranum), or another player on the server, you can select the docking bay to buy and sell items based on their supply and demand. Simply drag or drop items from/to the according slots in the Docking Bay menu, after right-clicking the Bay with your selected ship. Your money will change accordingly. When you build your own Docking Bay, you can define your own supply and demand. Other players on the same server can then trade with you by buying/selling the supplied/demanded items or blocks. If there's a Jump Portal nearby, neutral merchants (Human, Morgrax, Caranum) will regularily visit you Docking Bay to trade with you. Your money is adjusted automatically. Note that neutral merchants can only sell items at your Docking Bay, if you have enough money. 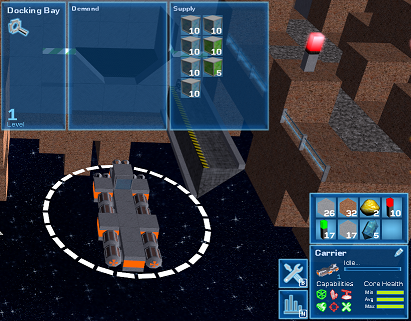 To setup a supply, simply drop an item from your ship into the supply slot. To define a demand, click the Add button and use the item-picker dialog to select a block or item you demand, and pick an amount. Your Docking Bay is then ready for trade. In the Automation Lab, you can buy transmitters to connect production buildings to storage or processing buildings. You can connect multiple transmitters to shape longer transmission lines. Transmitters are also used to transmit energy from a powerblock to an energy consuming building like a Factory or Docking Bay. This page was last modified on 4 November 2017, at 16:04.